A number of posts here (linked at bottom) described how Ontario’s liberal government spent taxpayers’ and ratepayers’ money like drunken sailers looking to score in International circles. It seems chickens do come home to roost, and those politicians are out in a landslide. The story from CBC (warmists all) is Ontario vote will hamper prime minister’s efforts on climate change Excerpts below with my bolds. Voters in the province of Ontario have sent a stinging rebuke to the ruling Liberal Party reducing it to a rump, and they voted massively for populist Doug Ford and his Progressive Conservatives. 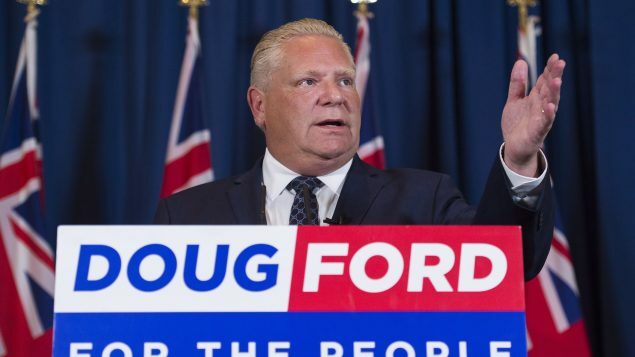 Ford has promised to take Ontario out of its carbon cap-and-trade agreement with California and the province of Quebec, and he is against Prime Minister Justin Trudeau’s plan to oblige all provinces to levy a carbon tax. “Now what you have is Doug Ford leading…the biggest province in the country…Now as premier of Ontario, he has one of the largest voices in the country when it comes to issues on the environment, the economy—all of these things that the premiers of the country and the prime minister have to sit down and talk about. Doug Ford now has the biggest voice at that table,” says Jordan Press, parliamentary reporter with The Canadian Press. “In much the same way that he (Trudeau) has an issue dealing with (U.S. President) Donald Trump on the environment, now Justin Trudeau faces a domestic issue as well, that how do you meet those international agreements that you have promoted. How do you continue to be that progressive leader on the world stage when at home, you are facing opposition to some of your plans,” asks Press. During the election campaign, Ford promised to cut taxes, reduce gasoline prices by 10 cents a litre, reduce the high price of electricity and offer beer for one dollar a bottle. He was criticized for not providing a clear plan for how he would pay for these promises. The province of Ontario already carries a massive debt load. But people seem to have appreciated his promise to defend “the little guy” and ignored a lawsuit launched by his brother’s widow alleging Ford mismanaged the family’s business costing millions from the estate. Some people compare Ford to Trump and debate about that will likely be vigorous long into the future. In the final tally, Progressive Conservatives were elected in 76 ridings and the New Democratic Party took 40. After ruling for 15 years, the Liberal Party lost official party status and the funding that comes with it by winning only seven seats. The Green Party took one.